A new study says that children are the most vulnerable and largest population affected by climate change but they continue to be ignored in global negotiations. “The challenges of climate change: Children on the frontline”, prepared by UNICEF, seeks to bridge this gap and broaden the understanding of child rights in the climate discourse, states a press release by the world body. Over 99 per cent of deaths attributed to climate-related changes occur in developing countries, and children make up over 80 per cent of those deaths, Anthony Lake, UNICEF executive director, says in the report’s foreword. More than 40 experts—scientists, development practitioners and specialists in health, nutrition and child rights—came together to prepare the report which details how climate-related deaths of children in developing countries are brought on by changing patterns of major disease vectors and natural disasters, by food insecurity and lack of access to drinking water and sanitation facilities. According to Lake, the challenge of climate change is huge and requires an urgent response from all generations. “Children who will inherit the Earth are the last people who should be excluded,” he adds. The authors estimate that over the next decade, 175 million children will be hit by climate-related disasters in South Asia and Africa alone. “Our children and grandchildren are our primary point of contact with those future generations and, if we understand how they will be affected, we are more likely to be persuaded of the necessity of humanity changing its course,” the report says. Children and young people make up 30 per cent of the world’s population. Sadly, 2.2 billion children are growing up facing the impacts of climate change. The report cites WHO estimates and says that a third of the global burden of disease is caused by environmental factors and children under five years of age bear more than 40 per cent of that burden. Malnutrition and infectious diseases contribute to the largest share of child mortality attributed to climate change. Children are more vulnerable than adults to famine and nutritional deprivation and represent the majority of the global population afflicted by hunger. 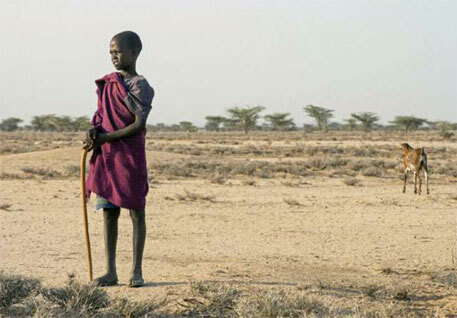 Climate change also threatens child rights upheld by the United Nations Convention on the Rights of the Child (CRC)—the foundation of UNICEF’s work for children around the world. The Convention, which was unanimously adopted by the UN General Assembly in 1990, recognises the human rights of children, defined as any person under 18, and sets out in detail what every child needs to have for a safe, happy and fulfilled childhood. CRC is the most widely ratified international human rights treaty in history with the ratification of 193 world governments. The report highlights some of the child rights that are at risk from climate change, including the right to non-discrimination, right to survival and development, right to health, right to protection as refugees and right to education. It says that children have the strongest interest in environmental matters and hence, their participation in mitigating climate change and adaptation must be ensured. In the report’s conclusion, Rajendra K Pachauri, chairperson of the Intergovernmental Panel on Climate Change, critically looks at where we stand today in the fight against climate change and analyses the success and failures of global efforts, the challenges that exist and the future scenario. What a load of tripe. These experts must have advanced degrees under Professor Bimbu from Figment University. Oddly John Kerry is telling these countries not to make more farm land for feeding their people as it adds to CO2 problem. My question is what kind of drugs are these people on to come up with these delusional unscientific claims that cannot be backed by sound scientific facts. Global Warming that was rebranded/renamed to Climate Change is nothing more than a political fraud to tax and line the pockets of a few and exert more power and control over the lives of people. There are other underling agendas with all of this that they're not willing to openly address and thats controlling/reducing populations on a global scale and they don't care how painful.